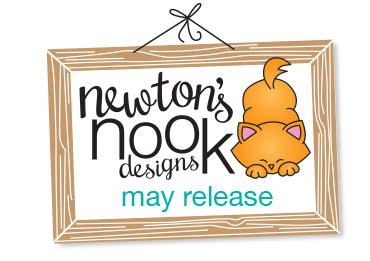 Today our FIRST release day for May and we are featuring the set Around the House! Ready for some Fun House-hold puns? Check out all the amazing cards below from our design team and special May release guest designers! Then, make sure to click through to all their blogs for details on their cards - Some of the designers have extra cards on the blogs and you might even find a fun video or two along the way! Make sure to comment for a chance to win! Details on the giveaway are at the bottom of today's post. 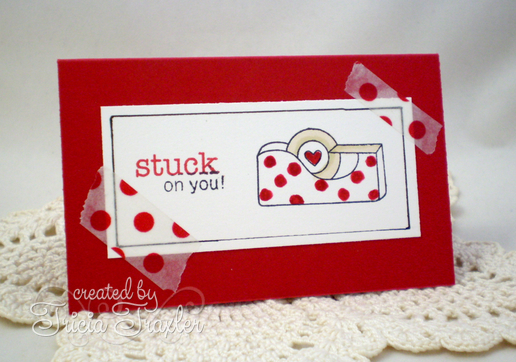 Guest Designer Tricia Traxler created this adorable card using the the tape image and cleverly combined it with some washi tape! Isn't that fun? 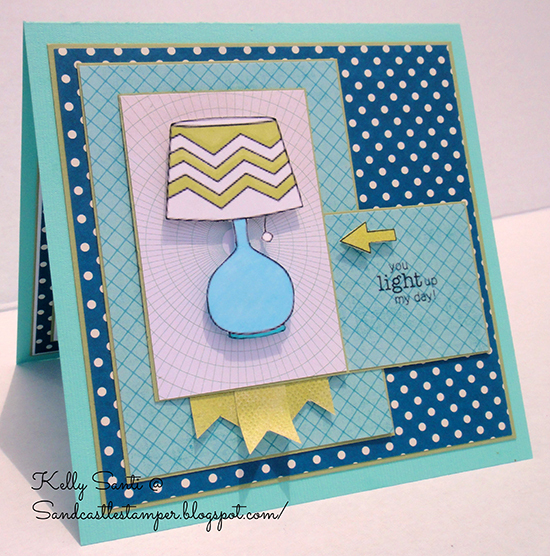 Guest Designer Kelly Santi used the fun lamp image! I love all the fun patterned papers she used too! Next - our design team is rockin' the house with this set! 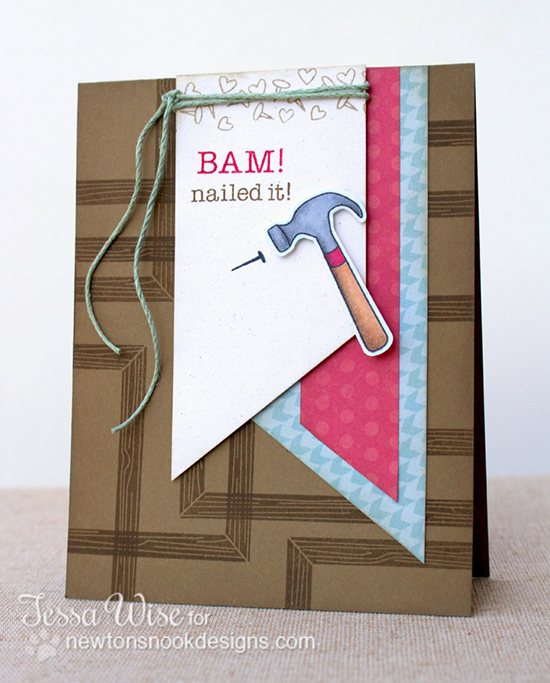 Here's a fun card by Tessa! I love how she used the frame stamp to create a background - plus those angled banners are so fun! 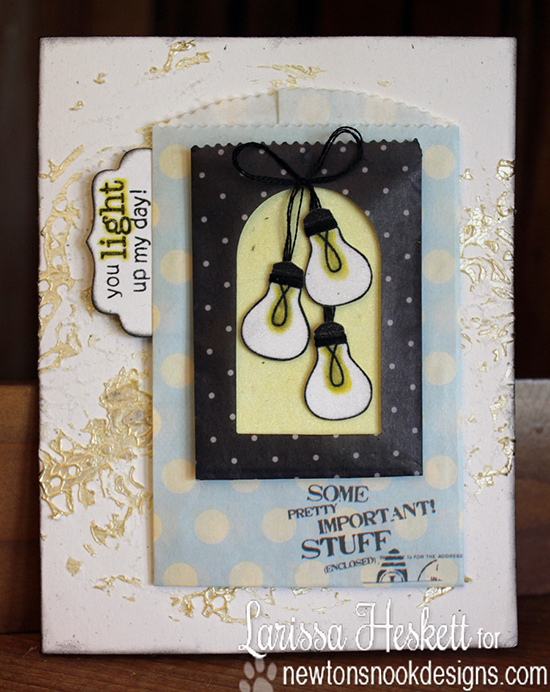 Larissa created a fun vellum pocket card! Love how she has those lightbulbs dangling from string! 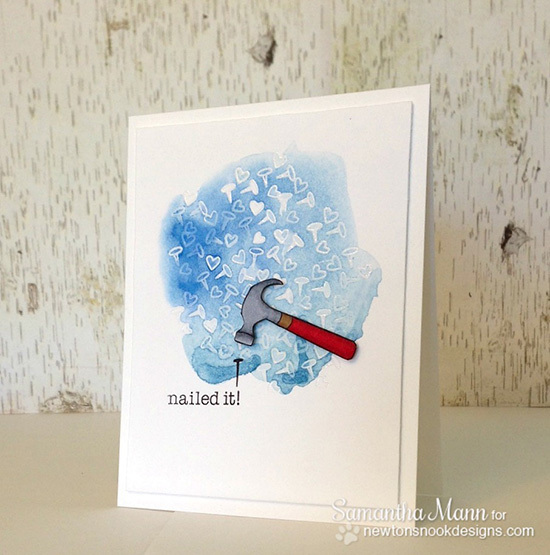 A beautiful watercolor card by Samantha - Isn't that background of nails and hearts so pretty? I didn't know you could make nails look pretty but she did! I really love the contrast of the bright watercolor background with the embossed white on black on this card by Valerie! Gorgeous! 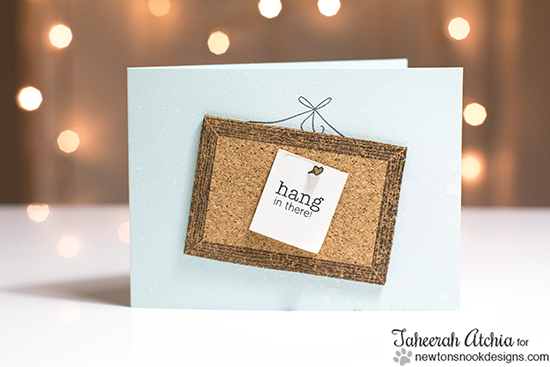 Love this little cork-board card Taheerah! It's so sweet and simple - great to encourage a friend! 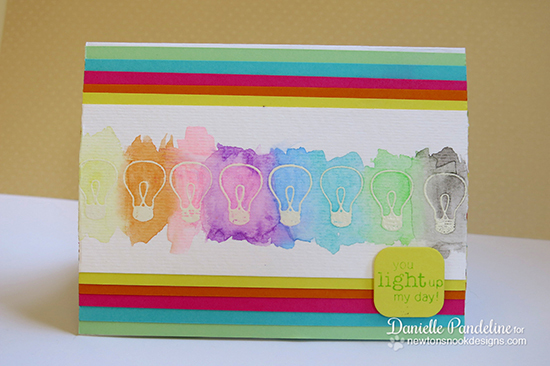 This card by Danielle has would brighten anyone's day with all the fun watercolored lights! 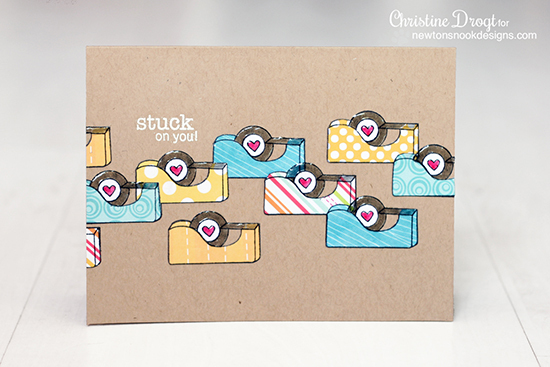 Christine created this fun card with all the bright tape dispensers- love how she did this! 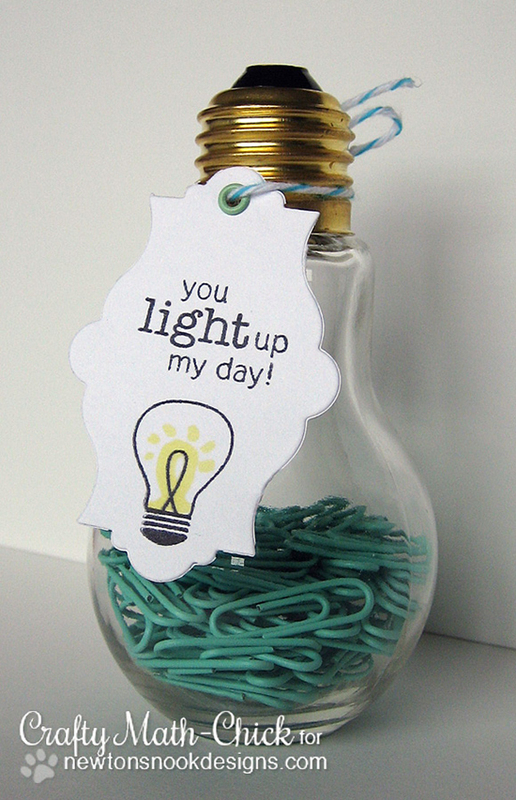 Crafty Math-Chick created a fun tag for this little lightbulb gift! How cute is that? 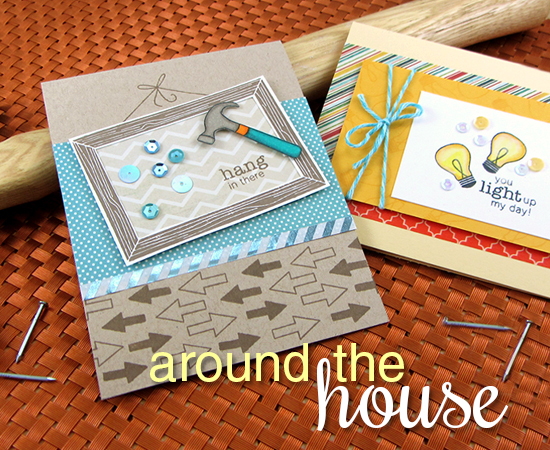 Would you like to win “Around the House”? Comment on the NND blog and Design Team and Guest blogs (see list below)! Two winners will be chosen at random from the collective blogs release posts. Make sure to check out each of their blogs and comment for your chance to win. You will not know which blog has been chosen so the more you comment on the better your chances are of winning! You have until Thursday, May 15th at 9pm Central Daylight Time to comment -- winners will be announced on the blog post on Friday, May 16th. Great job ladies!!!!! I am inspired by so many of these cards!!! Lots of watercoloring going on!!!! soo cute! great start for the May release!! What a cute set!! Love everyone's cards, sooo cute! What a fun,fun set! Love the everyday objects. These are fabulous and the DT projects are incredible! Love the tape dispenser. What a cute set! Love the BAM sentiment! Such an adorable set! Love the DT cards! very cute set amazing cards!!!! Love that set! It is awesome! And so are the cards... wow! Love these sets....wow are they cute!!! GREAT cards too everyone!!! Your DT rocked it! What a fabulous set and very creative projects! ACK!!! I love this set SO MUCH!!! Such a fun set! Thanks for the chance to win! Love the cards. These are pretty cool stamps with great sentiments. I've grown to love your stamps and this set is just amazing! Love how versatile it is. What a fun selection of cards! I'd love to win these stamps - thanks for the chance! I'm loving that lightbulb! Super fun stamp set! I LOVE this set, the tape dispenser is absolutely ADORABLE!! Oh my goodness, this is such a fun set! 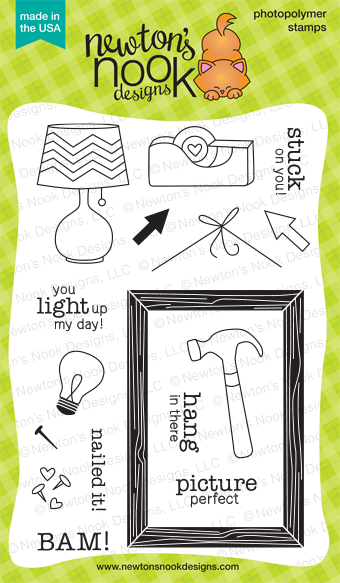 I LOVE the sentiments and that adorable tape dispenser! What a fun set. Wonderful creations everyone. Great hop. So many cute idea. Thanks for having the hop. This is such a fun stamp set...thanks so much for the opportunity to win! jennifer - those two cards you made ARE INCREDIBLE!!!!!!!!!!! LOVE LOVE LOVE LOVE LOVE the te4al sequins with the hammer! serisouly, wow! and those lightbulbs!! yes - i'm in LOVE! amazing!! i am so honored to be part of this team with all of these incredibly talented ladies!! This set is so cute and wow did the DT do a bang up job with it! !